I want to thank everyone for the tweets, facebook shares, and comments on my recent post about homemade oreos and sugar. I am pretty passionate about trying to separate food fact from fiction, so I hope to do more posts like that in the future. If you have a suggestion for something you’d like me to consider writing about- an issue related to confusion about nutrition/popular diets/health/weight loss etc., let me know in the comments section. This has been the prettiest fall I can remember. We’ve had what seems like an endless string of warm sunny days but as we speed toward November, I know these won’t last forever. The nights are getting chillier, and there was quite a bit of frost on my car early yesterday and today. This morning, I turned on the heat in my home for the first time so far this year. Every fall right around this time, I yearn to spend as much time outside as possible. I love to go for walks to experience the air, the crunch of leaves under my feet, and lately, plenty of sunshine on my face. I am loving it all. I know these days are not going to last forever. The other day I did something I have not done much lately. 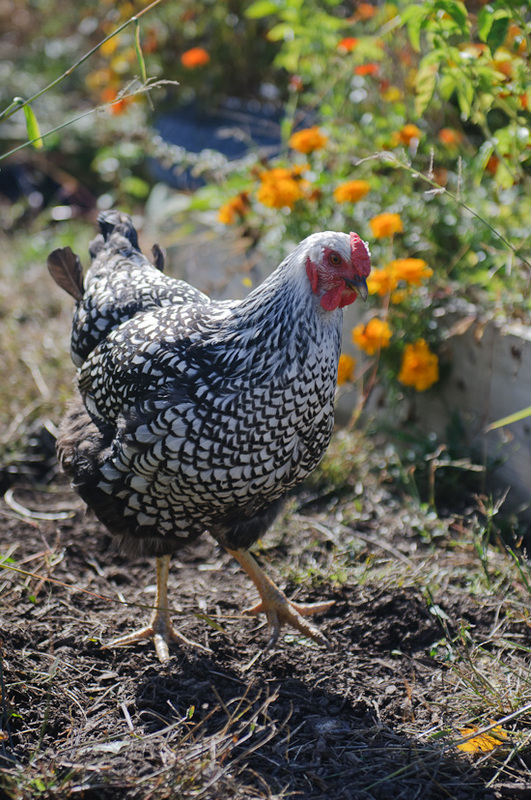 I spent a good long while hanging out with my chickens, and I took some photos. The one above was my favorite. I think it looks like she’s dancing. I don’t have too much else to say today so I thought I would share some great-looking, fall-inspired recipes from some of my favorite food blogs (and a few from my blog, as well). I hope this season has been as enjoyable for you as it has been for me, and that you too are truly savoring fall. Great round-up and I want that chicken! Such a beautiful shot of her. Happy Fall, Winnie! Thanks so much for including me in this round up! She does look like she’s dancing. When we had chickens, my favorite thing was to sit outside and watch them peck and scratch. Winnie, you asked for suggestions about other topics related to popular diets/weight loss etc. You say you’re passionate about trying to separate food fact from fiction. I was so excited to see someone write sensibly, as you did in your post on sugar, about how we demonize foods that I was going to do just that — make a suggestion. But now I’ve looked around your site a little more. It seems that in your writing to date about “one simple change” – an upcoming book, too – you’ve bought into the latest food fad, the anti-wheat and gluten craze that is nothing short of madness. I usually keep my mouth shut with my friends, who have self-diagnosed and made this actually very complex and dangerous change in their diets. I don’t propose to get into a full-scale debate with you. What I will do is beg you to keep an open mind. In time, I’m certain you’ll find that gluten avoidance was just another bandwagon everybody jumped on – most especially the food industry which immediately twigged to enormous profit potential. Too bad it’s also taking us even further away from real foods, healthy cooking and eating. A few of the things I’ve written on this blog in the past, and even in my book- including the info on grains- is stuff I am continuously questioning. I would love to hear more about your thoughts. You can email me at winnie@healthygreenkitchen.com if you’d like and we can talk more. Thank you for writing back so promptly, Winnie. I probably should have spent more time looking around your website before gathering, apparently incorrectly, that the “one simple change” you advise for your readers is to go gluten free. In other words, I assumed yours was one of the many blogs and books contributing to the problem instead of shedding much-needed light on our newest food craze. That is a very handsome chicken indeed. I was brought up on a farm and do miss that life close to the earth. Life takes over and you get swept along with it and you end up far from where you started. Beautiful chicken…and what a great way to welcome in fall. We all need to slow down and appreciate the beauty around us. Today, I took a long walk with Lucy and I listened and watched the leaves. The bright colors, the crunch beneath my feet…I felt so alive after doing so! If it’s not too late to chime in on requests for future topics, I am always interested in learning more about grains. They’re my favorite! and they seem to be the food item I read the most conflicting information on. Do they need to be soaked? Am I absorbing any quality nutrients by eating whole grains? Are all non-whole grains just junk food? Maybe this will be tackled more in your book, which I am looking forward to! Thanks again for approaching these topics. It’s so refreshing to read balanced posts with links to research and studies.